Download a free drug screening regulation report for all 50 states. Our intent is to make Pennsylvania drug test compliance as simple as possible. You don’t have to be a constitutional law scholar to conduct workplace drug testing in this state. Pennsylvania is a “Open” state, which means there are no state statutes, regulations or known court decisions that would limit your choices for implementing a drug or alcohol testing program or any aspect of it. Testing is your choice, but there may be federal rules to consider. This overview is to introduce you to the nature and history of the state’s workplace drug testing rules and to provide a basic understanding of the compliance issues you may face when testing for alcohol and drugs in Pennsylvania. Q1: Are there any state limitations for workplace drug screening policies? A: No specific requirements for employer drug screening policies in Pennsylvania. Q3: Are there any state requirements for test methods? Q4: Are there any state requirements or limitation for drugs you can test for? Q5: Are there any state requirements or limitations for specific notice of result? Q6: Is it required to use a Certified Laboratory? A: There are currently no requirements or restrictions but, we strongly encourage utilizing a certified laboratory for drug testing. Q7: What types of specimens can we test for? Q8: Are there restrictions for Alcohol Testing? Although, keep in mind that the use of marijuana for medical purposes has been authorized in Pennsylvania, and discipline for a positive test for marijuana patients is limited. An employer may not discriminate based on status as medical marijuana user in Pennsylvania. This state has no known statutes restricting workplace drug or alcohol testing, and no known regulation limits workplace drug or alcohol testing. Since there is no known state statute, regulation, or court decision existing in this state, you may be free, within the limits of applicable federal rules, to draft any policy you wish and to implement whatever testing program makes business sense to you. It is advisable to conduct testing according to the accepted standards of practice in the drug testing industry. “Recreational vs. personal” use of marijuana: We recognize that a majority of the country uses the term “recreational use” when referring to states that have legalized possession and use of limited amounts of marijuana for those over 21. Pennsylvania personal and medical use of marijuana. Medical Use: Governor Tom Wolf signed the Pennsylvania Medical Marijuana Act (Act 16) into law. The law took effect May 17, 2016. On June 1, 2016 the Department of Health announced that they had begun working on “temporary regulations” and will be seeking input from interested parties. The program is expected to be fully implemented within 18-24 months. The new law may impose limitations on employer actions. Relevant sections of the Medical Marijuana Act state no employer may discharge, threaten, refuse to hire or otherwise discriminate or retaliate against an employee regarding an employee's compensation, terms, conditions, location or privileges solely on the basis of such employee's status as an individual who is certified to use medical marijuana. It is also indicated that nothing in this act shall require an employer to make any accommodation of the use of medical marijuana on the property or premises of any place of employment. This act shall in no way limit an employer's ability to discipline an employee for being under the influence of medical marijuana in the workplace or for working while under the influence of medical marijuana when the employee's conduct falls below the standard of care normally accepted for that position. There are also employee limitations which indicate a patient may not perform any employment duties at heights or in confined spaces, including, but not limited to, mining while under the influence of medical marijuana. 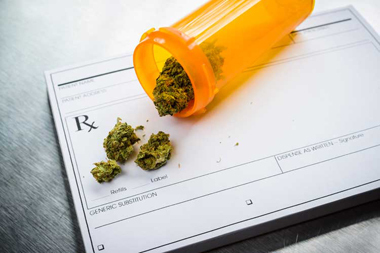 A patient may be prohibited by an employer from performing any task which the employer deems life-threatening, to either the employee or any of the employees of the employer, while under the influence of medical marijuana. Personal Use:Previous attempts to legislate personal use of marijuana in this state have failed. For more information regarding marijuana at work, refer to Info Cubic’s Drug Screening compliance corner. No known court cases at this time.